Whenever my inbox shows an email announcing new arrivals from the J. Crew Factory it's always a little bittersweet insofar as I know I am going to love something (okay, many things) but because of that I will have to make a purchase. (You would think from this description they were pointing a gun at me and telling me to take out my credit card.) I probably should just click delete and call it a day, but I sadly lack the willpower to restrain myself. Last month the Factory re-introduced the "Punk Floral" print in dresses, sweaters, shorts and skirts. I bought the scoop back shirt in this print last year, so I didn't feel the need to indulge in more "Punk Floral" items, although it was tempting. I did, however, cave for this button down shirt in "Dark Cove". It is a variation on the punk floral print, simply replacing the green background with navy. Initially, I ordered the shirt in my usual size xs, but found it to be very tight in the shoulders and bust. I exchanged it for a small which fit just right. It is a nice lightweight silk/gauze material that is just perfect for the warmer summer months. As you can see, I paired it with some neon colors, but I think it would look equally great with an army green or something more subdued. But you know me, go bright and colorful or go home! Perhaps at a later date I'll venture to try a different pairing. Wow! Great colors. Love the top. Thanks Felicia! 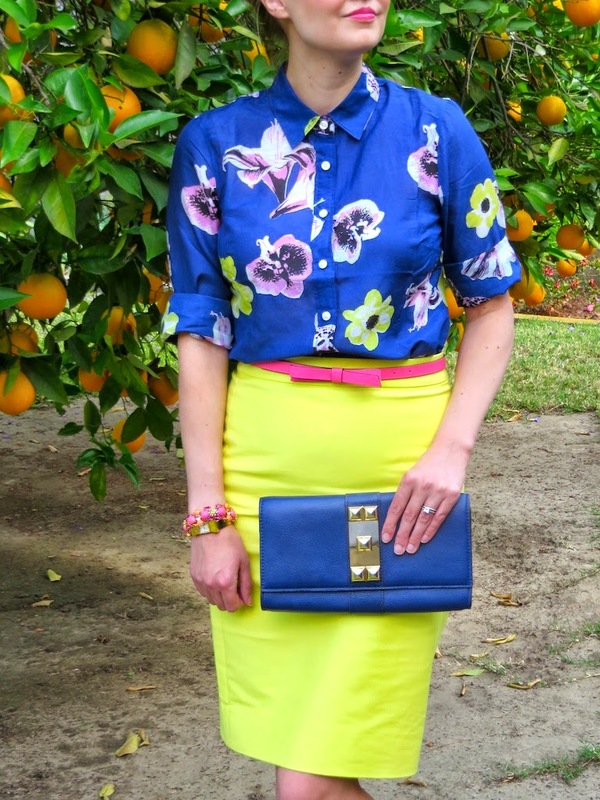 I thought the bright colors were perfect for spring.